CNC Machining is a vital part of the global manufacturing industry. Precision machining is the key term that specifies this industry, because machining is done by computer controlled devices. Although, these machines have eased the tasks for machinists, still they have to deal with tolerances, material limitations, and various other issues. But who says they cannot have some fun after a hard day? This is exactly the essence of GosigerFest 2017. This biennial event celebrates CNC machining and CNC machines. Being a key partner, Techna Tool is pleased to invite you to join us at GosigerFest 2017. This event will be held September 20 & 21, 2017 at Gosiger’s headquarters in Dayton, Ohio. At the event, you’ll get to see a large variety of advanced CNC machines, learn about the latest CNC manufacturing technology trends, and find solutions for your specific production problems. In addition to that, the event offers you lots of networking opportunities with over 40+ Gosiger partners. The good news is you can bond with your peers, prospective clients, and business leaders over a mug of quaff German draft beer, and accompaniment of the Polka Music by the world-famous Sauerkraut German Band. You can relish the fine German food throughout the day. There will be lots of surprises in the form of door prizes and raffles. 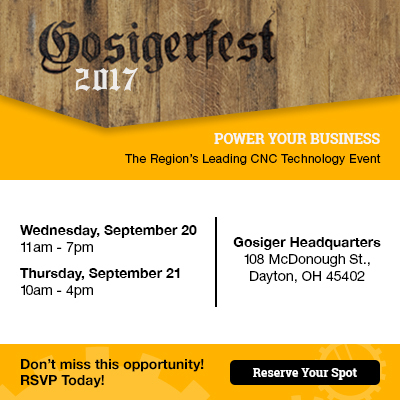 You must RSVP to attend GosigerFest 2017. Register today to book your spot at http://www.gosiger.com/gosigerfest-2017. This entry was posted in GosigerFest. Bookmark the permalink.